KANSAS CITY, Mo. — Certain places in your home can cause sewage backups, impacting not only your home, but your neighborhood and the city as well. If you've ever had a basement sewage backup, it can cause a mess. In cases like that, your sewer connection could be the problem. The city has a program called "Keep Out the Rain KC" to help solve the issue. Kansas City Special Assistant City Manager Andy Shively said the program helps reduce the diluted sewage overflow that go into homes, businesses and the city. "We've identified over 24 million gallons of rain water and had that removed from from our separate sanitary sewer system and identified another 10 million gallons that has yet to be removed.," Shively said. 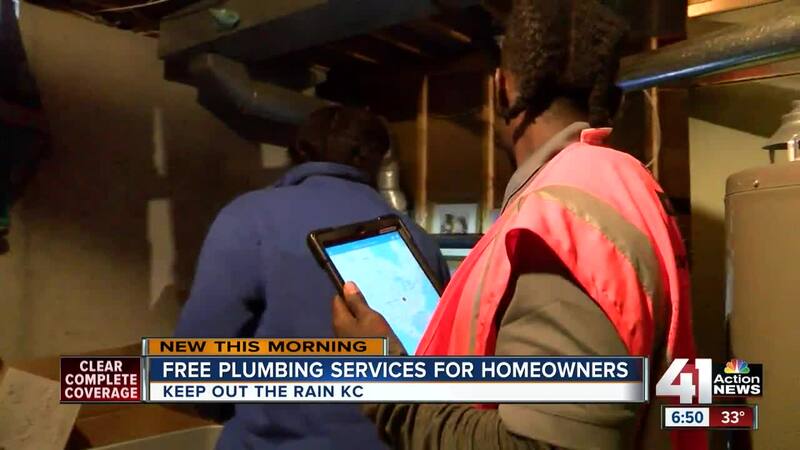 "So we're getting those appointments set up with homeowners with our plumbers to get those cost effective sources disconnected, to get that rain water out of the city's sanitary sewer system." Crews that are part of the program will come and evaluate your sewer connections. "Floor drains, making sure they're up to code, making sure the sump pump is up to code, making sure they're not getting any excessive rain water when it rains down that could possibly get into that floor drain and then on the outside. We look at down spouts just to make sure they're not directly connected," Marla Brown, a field technician said. Shively said if there's a problem with the connection that needs to be fixed, the city will pay for a licensed, pre-qualified plumber to do the work for free. "We will let them know at the inspection if we found cost effective sources to be disconnected and we'll work with the homeowner to schedule an appointment with a plumber to get those disconnections made," Shively said. The program is funded through wastewater fees collected through monthly water utility bills. You have to be in the program area in order to participate. Click here to see if you qualify.